Thermalix Spendtrue | That Was an Accident! Nobody’s quite sure when Thermalix crawled out of Kezan (nobody saw her do it), but it’s generally thought that the world hasn’t been the same since. While not quite the goblin equivalent of the Cataclysm, she is definitely her own personal self destroyer, and she spends a surprising amount of time in the nether realm, searching for her body. When not dead, she likes engineering, mining for teh profitz and taking screenshots in random places. 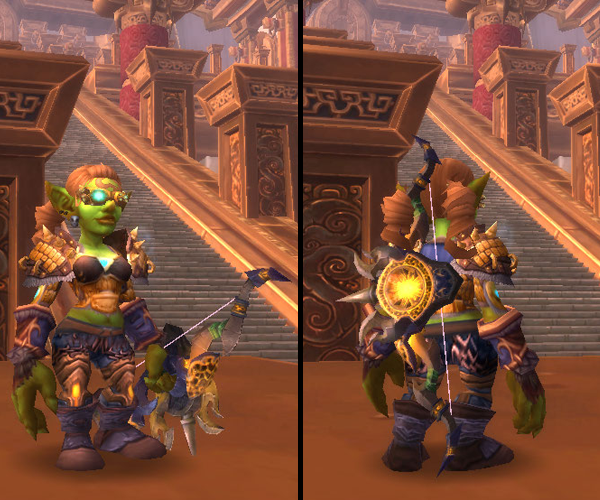 Despite being a hunter and presumably nature-oriented, Thermalix is also something of a fashionista who spends a good deal of time transmogging her gear. She often attempts to match her wardrobe to her active pets, but her limited funds and often changing stable make this goal “semi-reasonable” at best. Likes Feign Death and will run like hell at the first sign of trouble.